When the matter which was for hearing yesterday before Justice Inyang Ekwo came up Emmanuel Ukala (SAN) who announced appearance holding the brief of Chief Ferdinand O. Orbih (SAN) for Gov. Nyesom asked for a short adjournment to enable Orbih handle the matter. Orbih he added could not attend the sitting because he was before the Court of Appeal Port Harcourt division in a matter that was abruptly adjourned on Tuesday to Wednesday. Counsel representing the (1st defendant) Independent National Electoral Commission (INEC), Wale Ajayi did not oppose the request for adjournment. Plaintiff counsel, Achinike William- Wobodo, though did not oppose defendants’ plea for adjournment, said his client still maintained his earlier position of lack of confidence in the court and have deposed to affidavit. He orally sought to move the application. But, both defendants counsel said the plaintiff affidavit asking the judge to rescue himself was served on them in Court that morning. So, they needed time to respond to it. In his ruling, Justice Ekwo adjourned the matter to February 13, based on the consent of the lawyers. In the affidavit filed in Court the plaintiff claimed he would not get justice from the court presided by Justice Inyany Edem Ekwo because the judge had on 19th Nov. 2018 dismissed a suit marked No FHC /ABJ/CS/1020/2018 that gave Gov. Wike an undue advantage. He further averred that the judge would confined undue advantage on the 2nd defendant like he did on suit No FHC /ABJ/CS/1020/2018 wherein he dismissed it instead of striking it out. Secondly, the plaintiff averred that the present suit alleging certificate forgery was initially assigned to Justice A.R. Mohammed of Court 5 on 05/12/2018, only to be reassigned to Justice Ekwo ,when his counsel did not make any request that the matter be removed from Court 5. He claimed in his deposition that Wike certificate of birth (Statutory Declaration of Age) attached to his Form C.F.001 presented to INEC, purportedly deposed to on the 3rd October 1986 by one Collins Nyeme Wike had claimed that” Nyesom Wike is a native of Rumuepirikom in Obio / Akpor Local Government Area of Rivers State and that the said certificate was forged.” “That as at 3rd October 1986 there was no local Government Area known as Obio /Akpor Local Government Area in existence in Rivers State. As at 1986, Rumuepirikom was not in Obio /Akpor Local Government Area of Rivers State, but in Port Harcourt Local Government Area of Rivers State being the parent LGA from where Obio /Akpor Local Government Area was carved out. 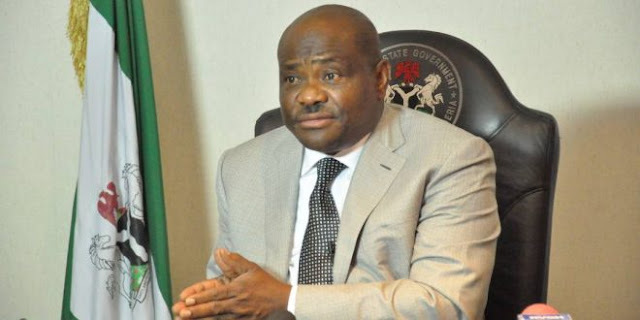 He said that Obio /Akpor Local Government Area of Rivers State was created in 1989 by Decree No 12 of 1989, two years after the alleged forgery was committed. That the certificate of birth (Statutory Declaration of Age) was purported sworn to and issued at the High/Magistrate’s Court Registry, Port Harcourt but allegedly bears stamp of the Judiciary Probate Registry, Port Harcourt. According to the plaintiff,” there was no Court Registry, whether in 1986 or afterward known as High/Magistrate Court Registry Port Harcourt. No such Registry existed or exists anywhere in Port Harcourt or Rivers State”. Plaintiff said the forged certificate of birth misled INEC into believing that Wike had a genuine birth certificate that confirms his alleged date of birth, given as 13th March1963.